Acessorz USB port compatible with iphone and ONE micro usb port transformes easily and ensures charging several devices at the same time. High-quality four-core copper wires enhance charging speed of the cables. The length is 3.3ft, you can consistently enjoy the happiness your phone brings to you without worries about sudden power off or short length. The 8 pin port: iPhone 6s plus /6s/ 6 plus /6, iPhone 5s / 5c / 5 / SE, iPad Air / Air 2, iPad Pro, iPad mini / mini 2 / mini 3 / mini 4, iPod nano (7th generation), iPod touch (5th generation), fit for all iOS 9 devices. Samsung / Nexus / HTC / Motorola / Nokia / LG / Sony/ Blackberry / PS4 / Xbox / PS Vita / Nintendo DS / GPS devices. BUILT TO LAST - Acessorz 4ft/1.2m USB 3 in 1 Cable is made of extra strong durable materials and nylon braded with aluminum. Dual connector compatible w/ Apple device. 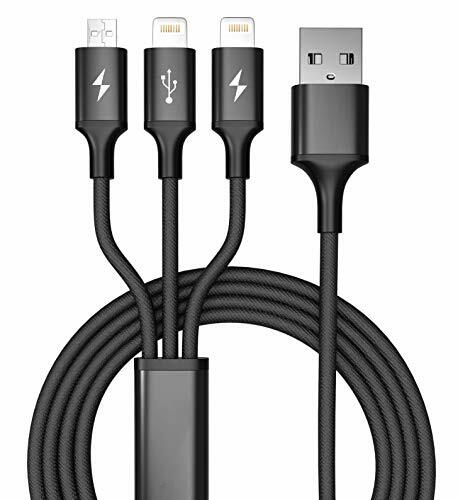 SUPER FAST TECHNOLOGY - This cable has the newest fast charge 5V/3A (Three devices total) technology and allows you to charge or sync your phone with your computer quick and easy (Only one USB port can sync). It has Micro USB and iOS Devices. Works for almost any cellphone, laptop, tablet, and iPad. SUPER COMPATIBLE -- Compatible with iPhone 8/8 Plus, iPhone X, iPhone 7/7 plus/6/6s /6 plus/6s plus, iPhone5/5c /5s/SE, iPad Air/ Air 2, iPad mini/mini 2 / mini 3,iPod Touch 5th gen, iPod Nano 7th gen and Samsung Galaxy Phones, HTC, Motorola, LG and other devices with a Micro USB port. LIFETIME WARRANTY -- Acessorz strongly believes in our products, so we provide you with LIFETIME Warranty. If you have any questions about this product by Acessorz, contact us by completing and submitting the form below. If you are looking for a specif part number, please include it with your message.